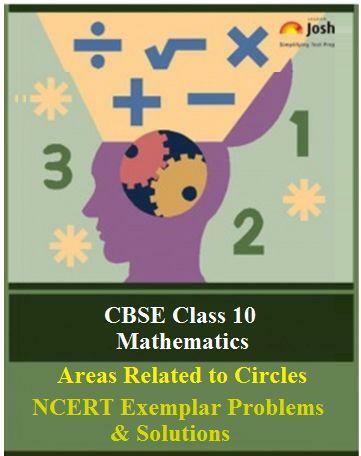 NCERT Exemplar Problems and Solutions for CBSE Class 10 Mathematics chapter 10, Areas Related to Circles (Part-IIIA). This part includes solutions to Q. No. 1-8 from Exercise 11.3 of Class 10 Maths NCERT Exemplar Problems, chapter 11. It consists of only the Short Answer Type Questions. Here you get the CBSE Class 10 Mathematics chapter 11, Areas Related to Circles: NCERT Exemplar Problems and Solutions (Part-IIIA). This part of the chapter includes solutions to Question Number 1 to 8 from Exercise 11.3 of NCERT Exemplar Problems for Class 10 Mathematics Chapter: Areas Related to Circles (Part-IIIA). This exercise comprises only the Short Answer Type Questions framed from various important topics in the chapter. Each question is provided with a detailed solution. of radii 15cm and 18cm. Hence, required radius of circle is 33cm. Question. 2 In figure, a square of diagonal 8 cm is inscribed in a circle. Find the area of the shaded region. Solution. To find the area of shaded region first we have to find the area of the circle and the inscribed square. and the radius of circle be ‘r’. Let the side of the square be a cm. Question. 3 Find the area of a sector of a circle of radius 28cm and central angle 45°. so as to keep a speed of 66 km/h? Question. 5 A cow is tied with a rope of length 14m at the corner of a rectangular field of dimensions 20m ´ 16m. Find the area of the field in which the cow can graze. The area covered by cow for grazing is in the form of a sector with radius 14m (= length of the rope). Question. 6 Find the area of the flower bed (with semi-circular ends) shown in figure. Given figure is a combination of a circle and a ΔACB. Since, angle in a semi circle is equal to 90°.